appearance: she is a black and white tabby with blue green eyes. She is a normal sized cat and her whiskers are slightly longer but it is usually not noticed. She has a normal sized tail, ears, eyes, nose, etc. personality: she is feisty when necessary, and and does not hold back at serious times. She is very independent and speaks her mind. She loves company, but at times she prefers to be alone. She is very kind and courteous, but when you get on her bad side you better watch out. In some ways she is like her older sister (Echostar, but its a secret :3 ) but in other ways she is her own cat. She loves fall and spring most of all because she loves color, and change. She hates to see suffering, and can do what she can to help. She wanted to be a medicine cat, but changed her mind and became a warrior. She does know how to tend to some wounds though, and she helps the medicine cat whenever she can. But she is a great fighter and a fabulous cat. history: She was born from a bengal she-cat who was in Thunderclan for most of her life, and from a Tabby tom who was a kitty-pet. She has one sister, her name is Echostar (dun dun DUN!) . Her parents had to abandon Echostar when she was a squirming kit, because her mother didn't want Thunderclan to find out, so she left Echostar in Windclans' care, but Thunderclan figured out that the Tabby kitty-pet was courting her and banished her from the clan. Soon after they were banished they had another kit (Silentrain), they did not abandon her when she wa a kit, but kept her in their care until she was 4 moons. Her parents told her that Shinningmoon (her father) was a kitty-pet and that they sent her sister Echokit (known as Echostar now) away. 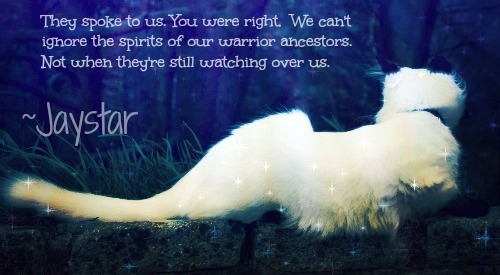 She was sent to live in Thunderclan, she told Thunderclan that she was a loner and didn't know who her parents were. They accepted her into the clan.